Point from where earthquake originate. Point on earth surface vertically above hypo center. Depth of focus from epicenter. It is important in determining extent of damage of earthquake. 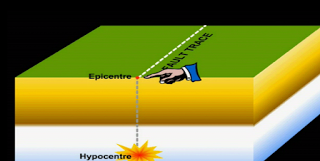 Distance from epicenter to point of any interest is called epicentral distance. As distance increase, effect of earthquake become less. Fault movement generate series of earthquake. Smaller size earthquake take place before big earthquake called Fore shock and those after big earthquake is After shock.